This week we will analyze several winter poems and create poems of our own. This week students are on spelling unit 9- vowell dipthongs: /oi/, /ou/, and /ow/. In grammar this week we will focus on how to determine which article to use before a noun- a, an, or the. This week students are revising, editing, and publishing their response to the DBQ. This week we will continue designing our solar houses. This week we will explore adding mixed numbers. Stride Academy is a fantastic adaptive program that our students can use to build and practice their skills in reading, math, and language arts. NISD has purchased a plan for each campus enabling every student to have his/her own account. It is an expectation that students are logging in at home every week and completing lessons in all three areas. Dr. Romer has just created a campus competition to see which class can log the most minutes and have the most correct answers over the winter holiday. The class with the most minutes logged and the most correct answers will receive a popcorn party when we return! Login information has previously gone home with your child and will be sent home again before we dismiss for winter break. We are also posting it here in case you want to get started right away. If you have any questions, please do not hesitate to call your homeroom teacher. Wear your favorite holiday headgear. Be like an elf or wear as much of your favorite color as you can. 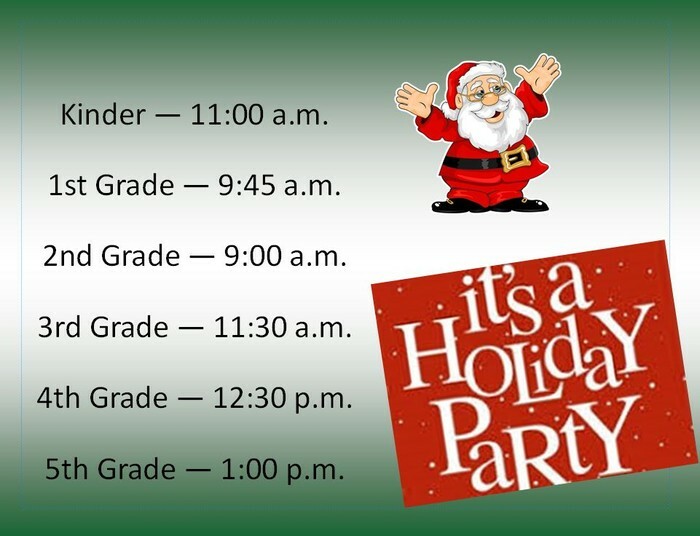 Wear red and green or your “ugly” Christmas sweater. Dress in theme for your grade level party. Parent communication folders are being sent home each night. They will be a daily communication tool between you and your child's teachers. The folders must be signed each evening and return with the student every day to school. We will communicate both positive and negative choices made by the student, and this record will help to determine the behavior grades on each six weeks report card. The calendar in there also lists upcoming events during this six weeks. Work that needs to be completed, as well as graded work will be sent home using this folder. Thank you in advance for helping to establish a routine with your child where they can talk to you daily about their learning. It is so important for kids to know that their parents value their education and are willing to take an active part in it. Signing the folders is one small way to show your child that you will take the time out of your day to ensure that they are being successful at school. If it is important to you, it will become important to them. PTA - Parent Teacher Association / What is PTA? PLEASE email the front office and your child's homeroom teacher should you have a change in how your child will go home. Ride changes must be made in writing, either in a note sent with the student, or in an email. Requests must be made prior to 2:00pm in order to ensure that it is properly communicated. Your child's safety is of our utmost concern.